Coding expert Guy Goldstein (creator WriterDuet) has turned J.V. Hart’s decades of expertise into a digital version of this indispensable story mapping tool to provide a practical, easy to use solution to your blank page fears and writing struggles. Import your existing scripts or start from scratch on a new story. 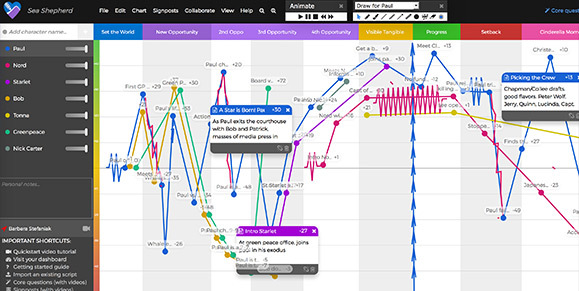 As the HartChart enables you to analyze and visualize your character-driven narrative it will lead you through a process that helps you build a great story to a satisfying ending… every, single, time. Video collaborate; share your charts with writing partners, production teams, class or writing group, with full editing or read-only access. Contact Us link for questions and troubleshooting.